I’ve partnered with my friends at Green Mountain Grill to give away this Davy Crockett Ultimate Tailgater Pellet Grill with open flame technology. GMG also now offers WiFi Point to Point Control for all models. There will be one (1) lucky winner who will receive this giveaway. The Future of Grilling is here! GMG now offers WiFi Point to Point Control for all models including this Davy Crockett. You can program your favorite customized sets of cooking instructions and save them forever. Their FREE APP will revolutionize the way you grill and give you complete control at your finger-tips! The Davy Crokett model comes with a digital control, a thermometer probe, a peaked lid, a side tray, a venturi-style firebox for cyclone combustion. The firebox has vertical grooves cut evenly on its sides so the air “whirlwinds” around the fire and gives much more complete combustion due to increased air circulation. This “cyclone” effect means more efficient pellet usage. 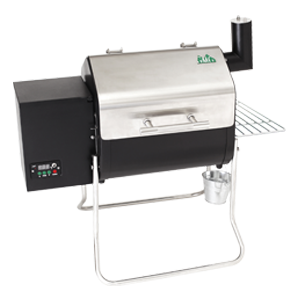 This grill comes equipped with an internal thermal sensor that regulates the temperature by adjusting air and pellet flow to maintain a desired internal temperature. The Open Flame technology lets you smoke low and slow or sear at high temperatures making this grill one of the most flexible units on the market. Enjoy grilling all year long! Other features include a 9 pound hopper, “fan only” mode with automatic shut-off to blow ash out of the firebox after you finish grilling. The folded legs double as handles. The unit weighs 57 pounds. This grill can be powered by an AC adapter, 12 volt plug or alligator clips. All of these are included with the grill. Eligibility: United States only. Last Day to enter for this Giveaway: Sept 8, 2018 11:59 pm PST. Winner will be randomly selected and contacted via email on Sept 9, 2018. Giveaways are open to registrants 18 years or older with a U.S. shipping addresses only. For Slap Yo’ Daddy BBQ ‘s international friends, you may enter and if you win, we will be more than happy to send the prize to a person of your choice with U.S. shipping address. No purchase necessary to enter or win. Winners have 48 hours to claim their prize, if not claimed within 48 hours, an alternate winner will be drawn at random. Anyone with a valid email address can enter each giveaway once a day everyday for the duration of the Giveaway. Employees of Slap Yo’ Daddy BBQ, their advertising or promotion agencies, those involved in the production, development, implementation or handling of Giveaways, any agents acting for, or on behalf of the above entities, their respective subsidiaries, affiliates, licensees, service providers, prize suppliers any other person or entity associated with the Giveaways (collectively “Giveaway Entities”) and/or the immediate family and household members (whether related or not) of each such employee, are not eligible. Please see Giveaway Rules for more details. The prize is proudly sponsored by Green Mountain Grills. Previous winners of this giveaway are not eligible to win this giveaway twice. If your entry was successfully submitted, you will be redirected to the “Thank You” page. That looks like a great little pellet grill your giving away. I have always wanted a pellet stove smoker. especially one I can take camping or tailgating with me, so I can show off my BBQ skills. The GMG Daniel Boone Pellet Grill is the best. Great stuff Harry! Good luck to all! A beautiful grill to have. BTW I do NOT work for Harry or Donna in anyway… I just believe it’s good to give like we want to receive and they need our votes so let’s help!! Great give away! Would be great for my daughter’s volleyball tailgating. My brother in law has one and he loves it. No entry form. Is this contest closed? Thanks Harry and the whole team. Won this in the August drawing..love it! Had a few issues that were readily solved by folks at GMG. Highly recommend . This could be the start of a great relationship, just me and my Grill! ! ! I’d be pretty awesome to win this and try out a pallet grill! Hope all you dad’s had a blessed Father’s Day!